Kahlúa is a deep brown coffee flavoured liqueur from Mexico. It was introduced in 1936 and has 20% alcohol by volume. 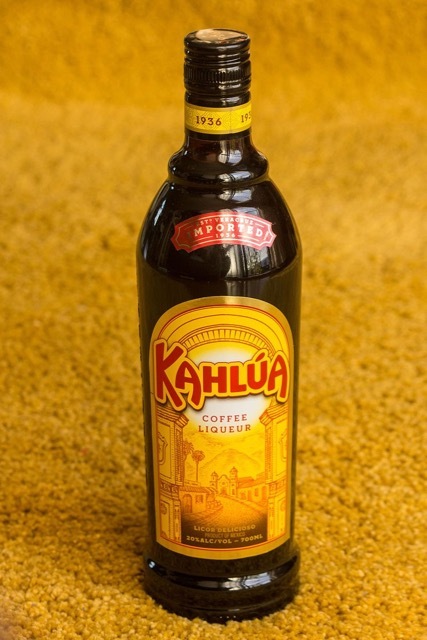 Kahlúa is made of rum, sugar, vanilla bean, and arabica coffee. It has a sweet, mild coffee flavour and a thick body. It’s sold in various sizes: 200ml, 375ml, 750ml and 1140ml. Tasting notes: it has scents of bittersweet coffee bean and roasted chestnut and multilayered flavours of fresh brewed black coffee and sweet butter. There are two other flavours, the Salted Caramel liqueur (salty and sweet) and the Chilli Chocolate Liqueur. The original coffee liqueur is an ingredient in many cocktails and drinks like the White Russian, Black Russian, Espresso Martini. Kahlúa Ginger Ale, Kahlúa Cold Brew Tonic, Kahlúa Sour Martini and Mind Eraser, just to mention a few. There is also a less sweet and more expensive Kahlúa Especial with an alcohol content of 36%, and a lower viscosity. It’s sold in US, Canada and Australia. I love Kahlua! Too yummy!